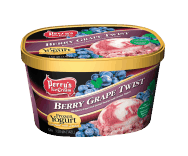 Blueberry grape fruit sorbet swirled with frozen yogurt. FRUIT AND VEGETABLE BASE (WATER, BLUEBERRY PUREE CONCENTRATE, GRAPE JUICE CONCENTRATE, SWEET POTATO JUICE CONCENTRATE, PURPLE CARROT JUICE CONCENTRATE, CITRIC ACID, NATURAL FLAVOR), SKIM MILK, BUTTERMILK, LIQUID SUGAR, CULTURED SKIM MILK*, CORN SYRUP, MILK, CREAM, CELLULOSE GUM, MONO- AND DIGLYCERIDES, GUAR GUM, CARRAGEENAN, DEXTROSE, LOCUST BEAN GUM, SALT, VITAMIN E, VITAMIN A PALMITATE, VITAMIN D3. *CONTAINS ACIDOPHILUS, BIFIDUS AND OTHER LIVE & ACTIVE YOGURT CULTURES.